I’m not going to give you a play-by-play of last week because, well, it would be tedious for me as the writer and you as the reader. 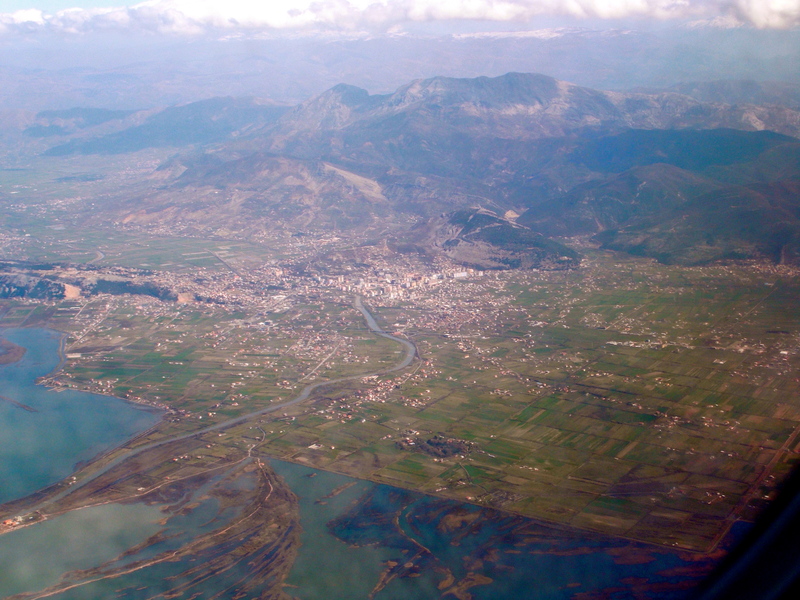 Suffice it to say that I am safe and sound in Librazhd, Elbasan, Albania. The fact that I didn’t miss a flight, lose a bag, or pass out due to jetlag is a miracle. The view from the plane. Yesterday the other PCVs and I met our host families. We stay with them for ten weeks during the notoriously intensive Pre-Service Training, then we get placed elsewhere in Albania for two years. My sector (TEFL—Teaching English as a Foreign Language) is in Librazhd, a small-ish town on a river (I can’t remember the name) surrounded by beautiful mountains. There are rows of brightly painted houses staggered up the hillside arranged around haphazard cobblestone alleys, and cafes and shops line the main roads. I live with my family—the Muzhaqis—on the fourth floor of a palati, or tall apartment building. A sage-domed mosque is just up the street (many Albanians identify as Muslims culturally but few actually practice) so I hear the call to prayer five times a day. There is a balcony attached to the flat where I can see almost the whole town, and I’m just a short walk away from the qender—or town square. Albania is a very beautiful country. I’ve attached some pictures that will hopefully convince you of that. When most Americans think of Eastern Europe they think of communism, graffiti, riots, and wrinkly old ladies that tell you stories about “The War” in indistinguishable Slavic languages. (Well, that’s what I used to think of. But I’m a terribly ignorant person.) I think, if they spent a little time here, most Americans would change their minds as I have. Albania is a very happy place, it just looks different than what we are used to. Everyone is friendly and social and the families love each other and take care of each other. Now that I think about it, it is actually better than the United States in this way. When you meet an American it’s a huge honor if they even remember your name the next time they see you. When you meet an Albanian they kiss you a minimum of three times, ask you intensely personal questions about your life, buy you things, and frequently grip your elbows and knees to show intimacy. The social norms here are just vastly different. Everyone is friends with everyone, everyone knows everyone, and everyone wants to meet you if you are new! And OMG, THE FOOD. My host mother—a cook by profession—stuffs me full of fresh homemade bread prepared in a wood-burning oven, goat cheese made in the hills, the most incredible olives you will ever taste (and I didn’t even like olives in America), byrek stuffed with spinach, and—my favorite—petulla, which translates to pancakes: little batter cakes fried in oil and served with crushed grapes. And the produce! I’ve never tasted any fresher or more delicious fruit than I have here, not even in the organic hippie co-ops in Oregon. I see food everywhere and more often than not I don’t know what’s in it but I’M GONNA EAT IT!!! I could go on and on describing my life here but it would sound too glamorous. In reality, experiencing a new culture is as difficult as it is fun. I have next to no privacy and next to no freedom because my family disapproves of young women staying out late and my daytime schedule is tightly regimented by the Peace Corps. The biggest challenge possible to someone who highly values independence. If you have a mental picture of me living cheerfully and carefree in Albania, read through the following list of things that have happened to me the past week to get familiar with the reality of being a Peace Corps Volunteer. Have heard more Ke$ha songs than ever before in the U.S.
Alright, then. Here we go. What an amazing journey you are on. I look forward to reading as you train and through your placement.